Bangor city officials plan to begin overhauling the portion of Pickering Square at the base of the pedestrian bridge this spring. Moving the entrance of the Pickering Square parking garage has been delayed until either the winter or spring, after the city struggled to find a contractor for the project this summer. The work is part of the first stage of the city’s massive overhaul of Pickering Square, a long-considered idea that finally got underway this summer. The multiyear plan not only gives the area an aesthetic facelift but is also designed to increase pedestrian safety. In addition to the parking garage, the square is home to the city’s bus depot. The initial, two-pronged phase was supposed to begin in August and wrap up this fall. But neither project attracted interest from contractors during the bidding process, city engineer John Theriault said. “No one needs work right now. The contractors are all busy,” Theriault said. The job involves moving the entrance of the Pickering parking garage to the opposite, right side, closer to the corner of Water Street, and completing landscape work in a triangular area between Merchants Plaza, West Market Square and Pickering Square. The projects aren’t very large and may have lost out to more better-paying projects, Theriault said. Remodeling the garage entrance is expected to cost around $250,000. The city will go back out to bid this month with a contract that sweetens the deal for contractors, and allows the firm to pick a timeline that suits its needs, Theriault said. That means work could start as early at the winter, or sometime next spring, he said. It’s unclear if the altered timeline will affect plans to rebuild the crumbling Kenduskeag Stream footbridge, work that is slated to begin next summer. Theriault said the garage work shouldn’t take long to complete. 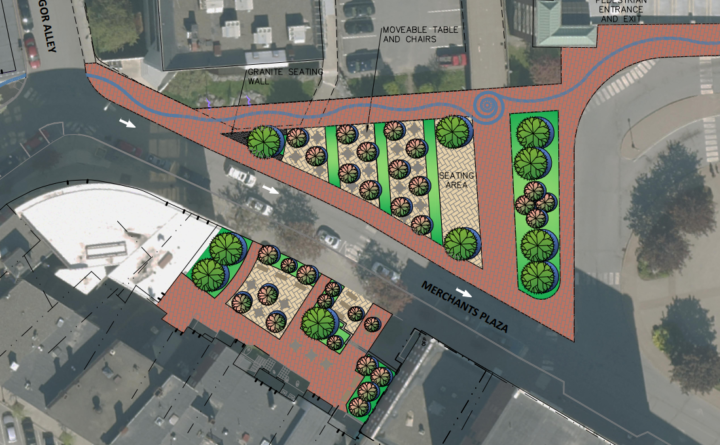 But landscaping the park near Merchants Plaza, which abuts the footbridge, will need to take place in the warmer weather.